This machine is use for new Benz Smart remote for Benz 220/215/210/202/203/219/211/231... New tool can programming new blank key with BIN file that's is generating using Dump Modify software without any dissolder of key MCU. it communication with key via IR and RF in mercedes benz security protocol . ( that's meaning you can use it for all type keys and if there any new key with private mcu no problem )need only to update . 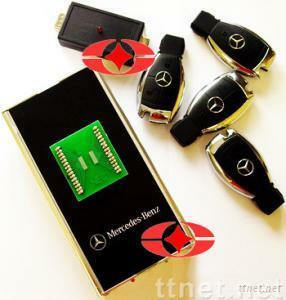 Thenew Mercedes device working with smart key (old and new) using in carsince 1997 up to 2005 - without keylessgo system. You can program newkey (ore used) in car and program oun key if its not work more.You readand program eeprom of CPU from Steering blocking module via diagnosticconnector (38 pins). Desolder and read via programmer two CPU fromElectronic Ignition Control Module.Load theese eeproms to program.Desolder NEC CPU from the key. Soldering it on the device , select theNo of key and program it. Solder all CPU on their places and start the car.